Sometimes I like to wonder where things originated from so I can compare the quality of it nowadays to its original incarnation. I wondered what the first horror movie was and found out that it is largely believed to be the 1922 silent film, Nosferatu. I wondered what the first video game was and concluded that it was Tennis for Two, though that debate still rages on. I've also wondered where anime originated and now I've got my answer. The Japanese manga series turned television show, Astro Boy, was the first that used the distinct visual style that is now known as anime. Now, 57 years after its first publication, Astro Boy is hitting the big screen in the form of computer animation and although it doesn't have the same appeal as a Pixar or DreamWorks picture, it is delightful nonetheless. Toby (voiced by Freddie Highmore) is the son of Dr. Tenma (voiced by Nicolas Cage), a brilliant scientist who found a way to break off Metro City from Earth and float it high in the sky in response to the declining conditions of the planet below, which had gotten to the point where it was hardly habitable, despite the population who still live down there and forage through trash to find food. Now, Metro City is flourishing and its success is due to Tenma, who created robots to do the work that humans don't want to. Meanwhile, another scientist, Dr. Elefun (voiced by Bill Nighy) has found a way to harness energy into separate spheres. There's a blue core that consists of pure positive energy that is said to be able to fix the world down below. However, this has also brought forth a red core, consisting of negative energy, which is extremely dangerous, as Elefun warns. Unfortunately, his warnings are not heeded and the red core is put inside of a new military technology, turning it hostile and killing Toby. In his grief, Tenma creates an exact robotic replica of Toby, dubbed Astro, with all of his memories and puts the blue core in as a foundation, making him perfect. There are many reasons why a movie succeeds or fails, but for one to really make a point and be special, it must have some type of prevalent theme. But that's not enough. It must also carry out that theme (or themes) intelligently. The recent Where the Wild Things Are had many and explored them well. Astro Boy brings up similar themes, like death and abandonment, but they are poorly drawn out and never hit home. Any type of message this film was trying to convey was lost in its own muddled structure (except for the unnecessary political message--that was plainly obvious). But as an action picture, Astro Boy delivers. The action is exquisite to look at and fun to experience. It comes fast and furious, it is quite thrilling and it pulls this movie through. Even with its dramatic faults, there's a charm to this adventure that keeps you entertained. With that said, the film begins to drag halfway through when Astro finds himself plummeting to Earth's surface. Here, it introduces uninteresting characters, creates bland relationships and features tired montages. It gives off the distinct feeling that the filmmakers didn't have enough material to cover a feature length runtime, so they threw their character down to Earth and had him participate in a number of exiguous events, including entering him into a robot brawling tournament that serves no narrative purpose other than to provide an environment for the police force of Metro City to swoop down and arrest him. Also to pad the length of an already exhaustive movie is a side story about the RRF (Robot Revolutionary Front, whose title explains itself) that goes nowhere, to the point where one of the robots in the alliance acknowledges their uselessness. It was counterproductive to the film and worked as little more than filler. Though the voice acting is good overall, Nicolas Cage brings this category to a screeching halt. From the moment his voice echoes through the speakers, it becomes instantly distracting. He is so bad you would think he'd never been behind a microphone before. He shows no emotion in his pivotal role, never conveying the sense of sadness a father would feel after the death of his son. He could just as easily have been talking about cheeseburgers and you wouldn't be able to spot any difference in inflection. Despite its many problems, the film does actually get quite emotional by the end and although you certainly won't cry, you'll be surprised by just how much you've latched onto the little guy. 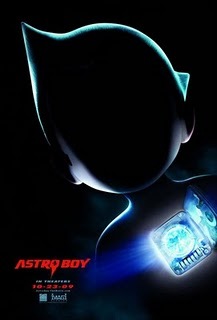 Astro Boy is a movie that will surely split viewers. There are enough significant problems that it would be hard to argue that the film is good. Conversely, it has enough entertaining material that it would also be hard to argue it is bad. I land in the middle, but I was charmed enough to tilt in the direction of a recommendation. If you go in expecting exactly what I've outlined here, you won't be disappointed.